If you think about it, the name "meatballs" is a little icky. I guess it's no worse than "meatloaf." My little brother refuses to eat meatloaf, yet he loves meatballs, which is interesting because they're basically the same thing. Perhaps it's all in the name. Or shape. Or perhaps he's just odd. This post, a respite from all the Christmas cookies and sweets, features two varieties of those ubiquitous balls o' meat. The first batch is from the ever-popular recipe entitled "Manhattan Meatballs." (Anybody know if they actually originated in Manhattan? Just curious.) I chose to make these for our office's winter holiday party over all others for a very significant reason--I had apricot preserves festering in the fridge. The sweet, fruity, and slightly spicy sauce was wonderful! I suspect it may have had something everything to do with the barbecue sauce I used--'twas a honey-chipotle blend. My co-workers had some nice comments about the meatballs and actually made the effort to say them to me, and I have to agree--the balls were delicious. The only other kind of meatball I've ever really tried is made according to a recipe that my grandmother has used for longer than I've been alive. I think it's safe to say that it's a winner. The balls are nowhere near as sweet, but still extremely tasty. So...which type tickles your fancy? Combine the first six ingredients and shape into balls. Place in a large baking dish. Mix up the sauce and pour it over the balls. Cover the dish and bake at 350 degrees for an hour, or until heated through. Preheat oven to 350°F. In a large bowl, mix the meat, bread crumbs, onion, eggs, parsley, and salt. Go ahead, use your paws. Shape into meatballs about 1 inch in diameter. Place in 2-qt. casserole dish. Mix the preserves and barbecue sauce and evenly pour over the meatballs; mix lightly. Bake for 45-60 minutes or until heated through, stirring occasionally. I think this'll probably be my last post until the Christmas excitement fades away. I hope ya'll have a safe and happy holiday! Grace both recipes look yummy! Meatballs is a funny word just like nuts. I did a post today on Candied Nuts, no other way to put it... or maybe the fruits or seeds of the pecan tree? Naw too long. Have a great day! They both look delish. I like my balls in meatsauce! They sounds so yummy. I'm looking forward to our Christmas Swedish Meatballs. Have a great holiday! Happy Holidays as well! These balls o' meat sound quite tasty. Have you ever had them cooked with grape jelly? Sounds gross but it's delicious. They both look great. I have never made sweet and sour meatballs before - my kids would love them. Ummm I prefer your brother! If your brother would dish me up a plate of these meatballs (of course if I were 20 years younger)..then again I do have a daughter who is 21....dang she is taken....Seriously though I love sweet and sour meatballs. I made your peppermint fudge, added butter, of course, for a plate of sweets for my neighbor including marshmallows and bark. It was way too easy to make and oh so good. I should have a post tonight or tomorrow on it. Thanks for the recipe. 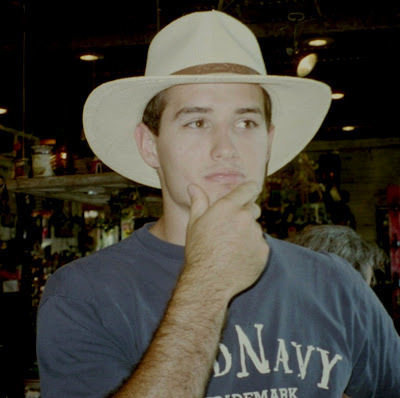 Also, how old is your little brother, because he is quite cute and I have two daughters. Hmm. Evidently there is a little competition for your brother. But Bellini Valli has one daughter and I have two! I make sweet & sour meatballs for superbowl sunday every year. I've never used jelly, however! These look so juicy...the best part about meatballs is that they make a great entree OR appetizer! I live in Manhattan and yet I've never heard of Manhattan meatballs...but meatballs, meatloaf, meat whatever...ground meat is delicious! As long as the little cocktail meatballs have been around, everyone still seems to love them. I like the idea of jazzing them up a bit with the apricot preserves. I love the apricot preserves idea! ANd I will have a meatball anyway you make it. These recipes sound heavenly. I did one recently with currant sauce. Oh it was amazing. Something about fruit and meat. It's funny meat loaf never sounds nearly as good. But it really depends on who made it adn whats in it. My Mom makes awesome meatloaf. Myhusband told me when we got married that he didnt like meatloaf. Ah, yah, he changed his mind! Merry Christmas Grace to you and your family! NIce post about a holiday party favorite! My family has never done much with meatballs though we like to eat them well enough. Our party standby is Little Smokies in a catsup/bourbon/onion sauce. If I had to choose, I think I would probably prefer your grandmother's recipe for the meatballs. Ok, so I'm in the category with your brother - love meatballs but not so much a meatloaf fan. Can't explain it. Your meatballs look fabulous - I'm definitely a sweet and sour meatball fan. Yum! Hmmm, Greg has some frozen meatballs that he bought at the store the other day - that sauce sounds really yummy to go with it! Thanks a bunch! Meatballs, meatloaf, logs of meat--I'll eat it all. that sauce looks perfect grace! Hilarious photo! The sauce sounds yummy, but then again, I'm a fan of meatballs already! I can't pick one over the other Grace, they both look good! I hope you'll be with your family on Christmas, Have a great holiday!!! I used to make Swedish meatballs all the time in college. Mmmm, love balls of meat. Eww, that didn't come out right. What I mean to say is that I love these meatballs! I can see why they were a hit at your office ... love those sauces, too! Hehe at the pic of your brother! I adore meatballs (and yes weird word when you think of it) and I am intrigued by the idea of sweet and sour ones! I loved this post. I've had to go back and catch up. I've missed you in all this Christmas craziness. Thanks so much for this recipe. I'm definitely making it New Year's for our appetizer party. They sound amazing and if you were able to squeak out some compliments from your cryptic co workers that is testament enough. I love putting balls in my mouth!! Haha, ok, sorry, my inner 13 year old popped out. But for serious - I love meatballs. I think it's because you can just pop little meaty balls and there's so much going on. These look absolutely splendid. I am sure these are a hit at holiday parties!! People are wierd aren't they? Psychgrad gags if she sees meatloaf but loves the sweet 'sour meatballs too. I don't get it but trust me - I won't be drawing the analogy of meatloaf/meatball anytime soon. LOL! It's one of those words that make you chuckle as it brings to mind "other" things! LOL! Sorry, I'm getting looks from the co-worker! If your brother is odd than so am I! I DO NOT like meatloaf but like meatballs! Not odd I say! Were they so good that you smacked grandma? Thanks Grace, I am making a second double round today because everyone at work wants them too. Merry Christmas Grace, may it be peaceful and restful! I always look for sweet and sour meatballs at a party...so good. That and those little smokies. Merry Christmas Grace! hope you have a wonderful day! Merry Christmas and the wonderful holidays, Grace! Either will do me. I hope you had a merry christmas. I love meatballs...I love spearing them with a frilly toothpick...i just love em'. These look delicious! Merry Christmas to you. Hope you had a great Christmas, Grace :)! Merry Christmas Grace!! Hope you had a super holiday! Funny, I ordered a meatball pasta dish at a restaurant a few days ago, thinking that I'd a couple little meatballs with it (wouldn't you?). Instead, what arrived was a small nest of pasta topped with a meatloaf. Yes, a meatloaf. A gigantic, square loaf. It broke the boundaries between the meatball and the meatloaf as distinct food items. However, it was awesome (if excessive) and it taught me to reconsider my prejudices against meatloaf. No, because I leave the lights on my tree too and just put it away in the extra bedroom, or as my ex used to say, "the mystery room". If I left the ornaments on it there would be no telling what devil cat (see the post on pets) would do to it. December is a month spent dragging her out of the tree and putting back everything that she has pulled down onto the floor. Sort of her own Disneyland. And it is really only at my house that there has to be some semblance in decorating. I love what everyone else does and just keep thinking, God I need therapy. I hope your Christmas was wonderful. Since I plan to marry Santa let me know what you want for next year. True... the name is a little disturbing... I've always thought that about meatloaf as well. And although my husband will eat it, we usually can't call it meatloaf. Both look like winning recipes!!!! I think both recipes look great, and a very good use of the festering jam. Good Job Grace!! I can't seem to take my eyes off that sauce! Hmm, I've never had a problem with the name meatball, probably because I grew up eating all sorts of meatballs? Those made of fish, beef, chicken etc etc... but yours look SO COMFORTING. And that sauce!! YUM! i think people are just weird and i'm including myself on that one. 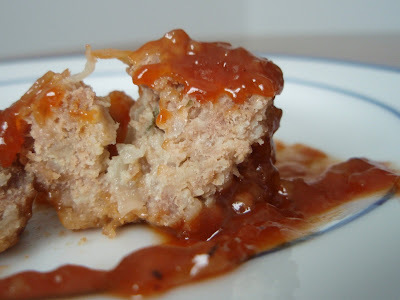 I like the idea of using the apricot preserves on the meatballs- it sounds like a winning combination. My favorite meatballs are my dad's bourbon meatballs. They are so popular that family and friends alike insist that he make them every year for our holiday party! 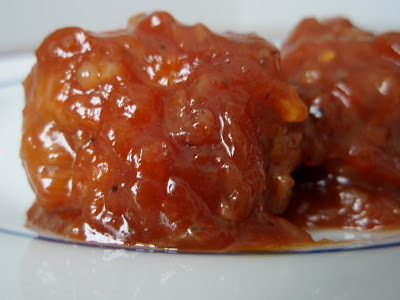 I would never have thought of using apricot preserves in meatballs - fascinated now. Love the saucy ones and how can you go wrong with honey-chipotle?? Well I SWEAR I saw these droolworthy nuggests of savoriness over the holidays, but I guess I didn't take the time to tell you I stopped by. What a complete slacker I am. I have several different kinds of jam "festering" in my fridgy along with a few unmentionables. I should put them out of their misery with these. My menfolk would swear they'd died and gone to heaven since there would be no party. They think balls are the ultimate party food. Along with cocktail weenies, of course.